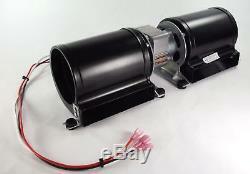 Fireplace Blower 2 Speed Motor HB-RB167. Regency 846-515, 910-157/P, F1100, F2100, F2400M, F3100 Classic (Free standing woodstove). Osburn, Nordica Fireplace, Valley Comfort and Pacific Energy. The right part at the right price! We only sell Quality NEW parts! We are here for one reason; to satisfy you, the customer... We want you to get the right part. Please send us your model number or questions. Manufacturers part numbers are solely for identification. All materials supplied by us are our replacements for manufacturers parts. All product and company names are trademarks or registered® trademarks of their respective holders. Use of them does not imply any affiliation with or endorsement by them. The item "Fireplace Blower for Regency, Nordica, Valley Comfort, Pacific HB-RB167 NEW" is in sale since Friday, October 13, 2017. This item is in the category "Home & Garden\Home Improvement\Heating, Cooling & Air\Fireplaces & Stoves\Replacement Parts". The seller is "jpinnovativesupply" and is located in Corona, California. This item can be shipped to United States.